The most common types of zucchini include ones that are straight, slim and either dark green or yellow in colour. English zucchini is a little fatter in shape and is speckled green and white. To pick the best zucchini, choose one that is shiny, firm, vibrant in colour, (whether light or dark green) and free from spots, cuts, bruises or blemishes. Keep in mind that smaller zucchinis will be more tender then larger ones. A good size is four to eight inches long and two to three inches thick. 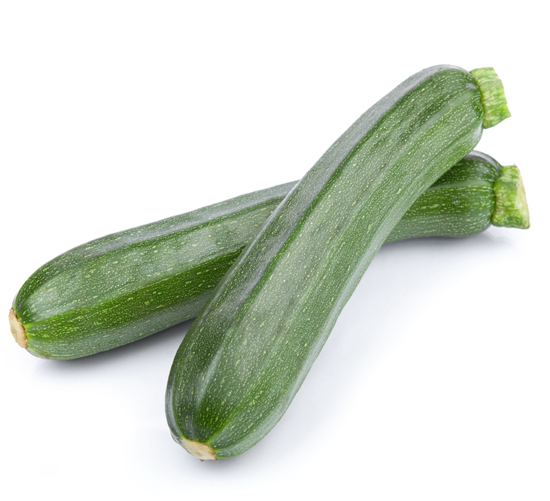 Larger zucchinis are best used for baking because they are firmer in texture and take longer to cook on the stovetop. You can store zucchini in the refrigerator in a plastic bag for up to five days. Take care not to wash your zucchini until you’re ready to eat or cook it. After you wash the zucchini, blot dry and cut off both ends. 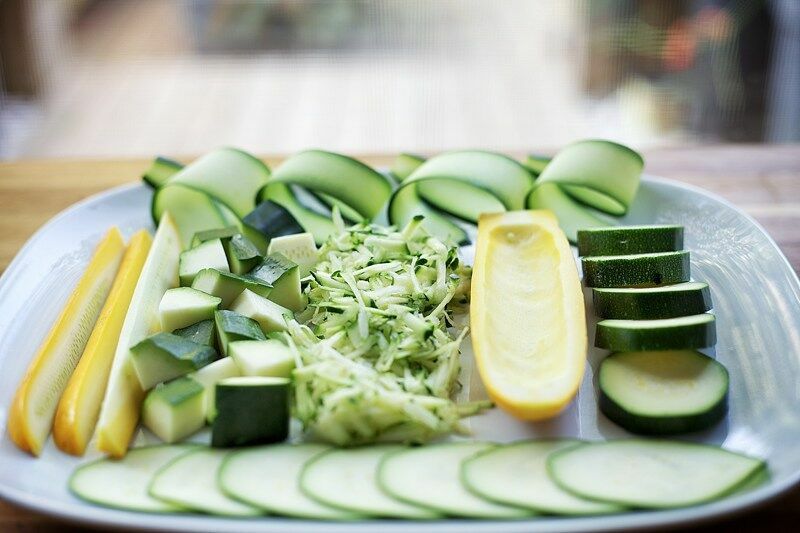 Zucchini can be enjoyed raw in salad or as part of a veggie platter. 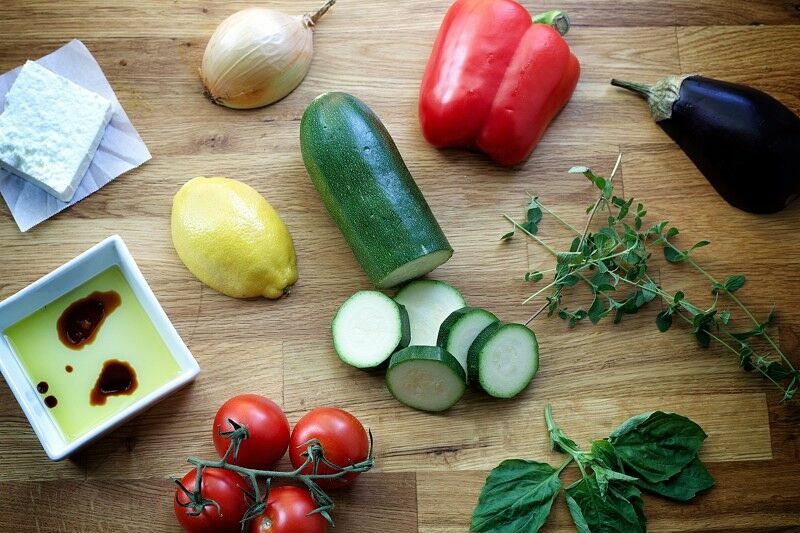 Since zucchini is typically quite tender from being harvested early, you can eat the skin. Cooking it with the skin intact will also provide better structure while heated and will help to contain more nutrients. Because of its substantial water content, it doesn’t take long to cook when steaming, roasting, baking, sautéing or deep-frying. For best results, only cook zucchini until just tender-crisp. Important to note: three medium zucchinis will yield about three cups of sliced zucchini. Zucchini holds a lot of water. To reduce the amount of water and for crispier results in cooking or baking, simply salt diced, sliced or grated zucchini and let sit for half an hour. Rinse the zucchini and squeeze dry with a paper towel. This will leave you with slightly dehydrated zucchini that will soak up flavours more easily and won’t dilute your dish with water that evaporates from the vegetable while cooking. Zucchini is best enjoyed when it still has a little bite left to it. To make sure you don’t overcook zucchini, keep an eye on its skin. During the cooking process, the edge just under the skin will turn bright green as it cooks. This is a good indication that it has reached its tender-crisp point. Grate zucchini using a large-hole box grater and add to meatloaf, pasta sauces, and burgers. It will add moisture, nutrients and flavour. It also is a great way to hide veggies in foods for picky eaters! 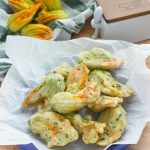 Have you tried zucchini blossoms? This edible flower from the squash plant comes in shades of yellow and orange, is soft and delicate and tastes faintly like the vegetable it comes from. They are available from late spring until early fall. What Goes Well with Zucchini? If you have access to a spiralizer, you can cut zucchini into noodles (or “zoodles”) to use as a raw pasta for a lightened “pasta” dish. Zoodles can be eaten raw, or quickly blanched for a softer texture. 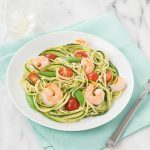 You can serve the zoodles like spaghetti with any sauce you like, or with shrimp and pesto like in this zucchini zoodle recipe. Try roasting zucchini with mushrooms, sweet bell peppers, eggplant, and onion and serve as a side dish. Zucchini is also great in a ratatouille (also baked), a frittata, or mixed into fritters for breakfast. Zucchini is delicious grilled, served on its own with some olive oil, salt and pepper, or chopped into a grilled veggie salad. 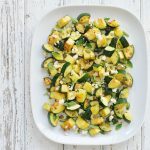 This recipe for sautéed zucchini with feta and oregano is delicious, and it makes the perfect summer side dish – plus it can be cooked in no time flat. Zucchini Parmesan-crusted chicken is a 3-ingredient dinner the whole family is sure to love. Fried zucchini blossoms have a tender, mellow flavour to them that turns into a succulent treat when lightly dredged in a bubbly batter and fried to a crisp. 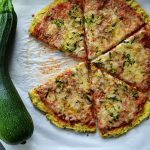 Zucchini crust pizza forms a sturdy gluten-free base for all your favourite pizza toppings. Go for crumbled sausage and feta or keep it simple with tomato sauce and mozzarella with a little extra grated zucchini sprinkled on top. 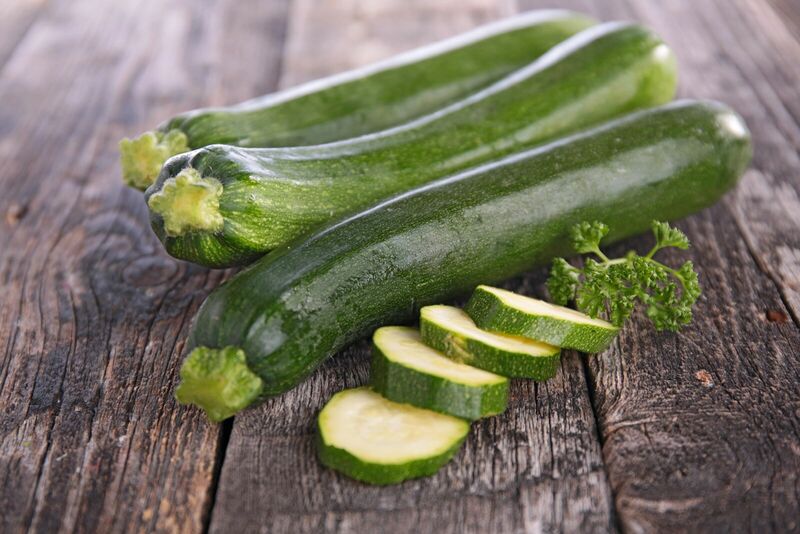 Due to their high water content, zucchini are high in nutrition while low in calories. One cup of raw, chopped zucchini yields about 20 calories, but packs 35% of your daily vitamin C, 14% of your daily vitamin B6, 11% of your daily manganese, 10% of your daily riboflavin, and 9% of your daily folate. Eating vitamin C along with sources of iron is reputed to help your body absorb more iron, so eating zucchini with iron-rich foods such as dark, leafy greens means a higher absorption of iron!